Bainbridge Island is both a city and island in the Puget Sound just east of the Kitsap Peninsula. It is a part of Kitsap County in northwestern Washington and has a population of 23,500 residents, making it the second largest city in the county. “Neighbor” cities include Suquamish, Poulsbo, and Seattle. Bainbridge Island's natural beauty is largely untouched forest, peppered with agricultural land, parks and walking trails. There are three major areas of commerce, where you'll find unique restaurants, boutiques and wineries. 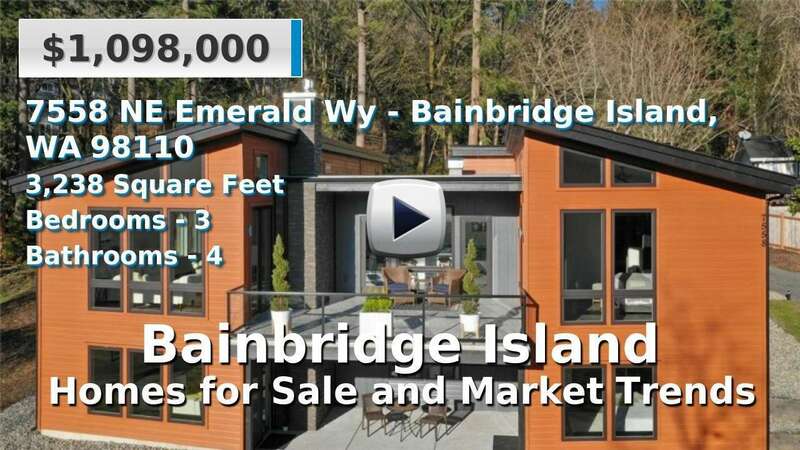 With 53 miles of shoreline, Bainbridge has no shortage of homes and condominiums for sale with waterfront property and-or views. Residents either work on the island or commute by bridge to Kitsap County or by ferry to the Seattle-Bellevue metro area. 4 Beds | 2.5 Baths | 3796 sq. Ft.
4 Beds | 2.25 Baths | 2454 sq. Ft.
4 Beds | 2.75 Baths | 3025 sq. Ft.
4 Beds | 3 Baths | 3441 sq. Ft.
4 Beds | 2.75 Baths | 2816 sq. Ft.
4 Beds | 2.5 Baths | 2595 sq. Ft.
4 Beds | 3.75 Baths | 3298 sq. Ft.
4 Beds | 3.5 Baths | 3654 sq. Ft.
3 Beds | 2.5 Baths | 3181 sq. Ft.
4 Beds | 2.5 Baths | 2980 sq. Ft.
5 Beds | 4 Baths | 4231 sq. Ft.
3 Beds | 2.5 Baths | 2973 sq. Ft.
2 Beds | 2 Baths | 1078 sq. Ft.
3 Beds | 2.5 Baths | 3081 sq. Ft.
3 Beds | 2.75 Baths | 4308 sq. Ft.